It is a rainy day. "That is too bad" you say. "No, that is good (sort of), we say. This will clear the smog from the air. 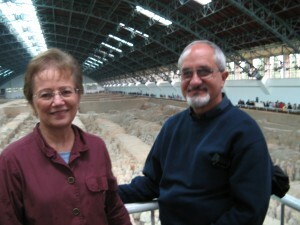 Our driver picked us up about 9:30 and we are off to see the Terracotta Warriors. On the way we stopped at the government sponsored factory of Terracotta Warrior replicas. They are the only official outlet that makes the statues with the same formula of clay that the originals were made with. They showed the process of how the molds are used and the drying and baking process. They also make furniture at this factory and we watched as the pieces were lacquered and the painting details were manually applied. Shipment and insurance is included in the shipping of all larger pieces of statues, furniture and silk rugs. We dropped a few Yuan in this outlet. We then proceeded to the Terracotta Warrior location. 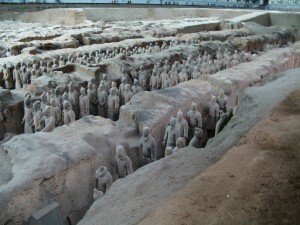 These warriors, 6-7000 of them, were made to be buried with the Qin (pronounced chin) emperor. He was the first emperor of the united China back in 210 BC. The first location was discovered by a farmer digging a well in his field in 1976. Since then three pits have been uncovered with work continuing daily to uncover and reconstruct the Warriors. 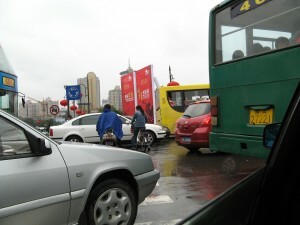 This is another Chinese location that is hard to describe but can only be appreciated in person or with many pictures. We were going to view another location containing the Emperor's tomb, but due to the rain and the fact that there really wasn't that much to see, we skipped it. On the way back to the hotel we got caught in a typical traffic grid-lock. Our driver has little patience with this and weaved in and out, around and back and forth, honking his horn until he finally got us back to the hotel. We rested up for awhile and then he took us to the Muslim Quarter where we wandered the streets looking at vendor's stalls. Carol bought some candied Kiwi fruit. 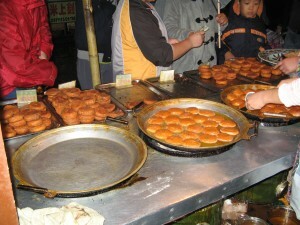 On one of the streets we tried some fried batter covered persimmons combined with some other stuff I can't remember. They were very sweet, greasy and tasty! We ended the evening having dinner at a chain restaurant that specializes in the food of North Eastern China. This was not our best meal to date. As a result there will be no pictures of food that I rave about. Introduction to Xian Shanxi Province, 1,200km (744 miles) SW of Beijing Surrounded by rich loess farmland, Xi'an (Western Peace), the present capital of Shanxi Province, was home to the ruling houses of the Qin, Han, Sui, and Tang dynasties, when it was known as Chang'an (Eternal Peace). The city reached a peak during the Tang dynasty (618-907), when it was the military and trading base for China's shaky control of the Silk Routes. During the Xuanzong reign of the Tang (712-755), Chang'an boasted two million taxable inhabitants and was the largest, most cosmopolitan settlement in the world. The scale of the metropolis is readily imagined -- what are now referred to as the city walls were rebuilt during the Ming dynasty (1644-1911) on the remains of Tang palace walls. The Tang city walls extended 8km (5 miles) north-south and almost 10km (6 miles) east-west, and the south gate opened onto a tree-lined avenue 150m (500 ft.) wide, down which foreign emissaries would once approach the metropolis. The Tang era was a high point for advocates of "foreign religions" as Manicheans, Nestorians, and Buddhists flocked to the capital. Buddhism in particular enjoyed royal patronage. Surviving monuments open a window onto the imperial power and cosmopolitan style of the old capital. 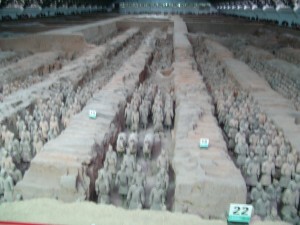 The short-lived totalitarian state of Qin Shi Huangdi is reflected in the awe-inspiring massed terra-cotta armies of the Qin Bingmayong Bowuguan. The influence of Buddhism is clear from the majestic spire of the Da Yan Ta (Great Goose Pagoda), constructed under the supervision of Xuanzang (d. 664), who returned to China in 645 after 15 years of travel across India and central Asia. Evidence of the flourishing trade along the Silk Routes may be found in the Shanxi History Museum and Famen Si. There is enough to see in and around Xi'an to keep even the most energetic visitor busy for a week or two. It's the most-visited town on the Silk Routes. Terracotta Warriors This is the reason most visitors come to Xi'an, and unlike many big sights in China, it does not disappoint. Amazingly, the warriors are just one piece of Qin Shi Huang's attempt to reconstruct his empire for the afterlife. The tomb to the west is still to be fully excavated, and is said to include a full reconstruction of the ancient capital, complete with rivers and lakes of mercury. According to historian Sima Qian, over 700,000 workers were drafted for the project, and those involved in the construction of the tomb were rewarded with graves beside their emperor. Tourism officials pray that the warriors are "just the tip of the iceberg," but it is just as likely that the tomb was plundered during the Tang or Song dynasties. It's hard not to get a shiver down your spine as you survey the unromantically named Pit 1, with four columns of warriors in each of the 11 passageways; there are over 6,000 infantry in battle formation, stretching back 182m (600 ft.). Originally painted in bright colors, they were constructed from interchangeable parts luted together by clay. Because the heads were hand-molded, no two appear the same. Qin Shi Huang's army was drawn from all over his vast empire, and this ethnic diversity is reflected in the variety of hairstyles, headdresses, and facial expressions. Even on the mass-produced bodies, the level of detail is striking, down to the layering of armor and the studs on archers' shoes that prevented them from slipping. The average height of the warriors is 1.8m (5 ft. 11 in. ); senior officers are taller. Pit 2 holds 1,400 soldiers and cavalry and a taller (nearly 2m/6 1/2 ft.) general; pit 3 houses the headquarters, with 68 senior officers. A small hall just to the right of pit 1 contains a display of two magnificent bronze chariots, reconstructed from nearly 3,500 pieces excavated from a pit to the west of the tomb. Founded during the height of the Tang dynasty in 742, this is one of the most tranquil places in town and the center of a sizable Muslim community, residents in Xi'an for over 1,200 years. As with Baxian An, half the adventure is getting there, as you veer left just north of the Drum Tower. The covered alleyway, Huajue Xiang, has good-humored vendors selling all manner of weird merchandise and it may take you a few attempts to find the mosque. The courtyards are spacious and have a gardenlike feel, with a wonderful fusion of Arabian and Chinese architectural styles. To the right of the entrance is a hall filled with exquisite Ming furniture. The central courtyard has a triple-eaved octagonal pagoda from which worshippers are called to prayer. The prayer hall is normally closed to non-Muslims. As this is an active mosque, be circumspect in taking photographs.